If there’s a buzzy beauty product that everyone is talking about, you’d better believe I’m trying it out for myself. I regularly test out the latest cult beauty products to land on shelves because I want to see if they’re really worth the hype. And as a result, I’ve used my bathroom as the testing grounds to experiment with hundreds of cult beauty products over the years to see if they actually work. Some have been disappointments. There’s a famous drugstore mascara I’d seen in dozens of articles (and in the makeup bags in plenty of insiders), but when I used in myself, it left a barely-there tint on my lashes that left me feeling pretty underwhelmed. On the other hand, there have been plenty of cult products I’ve loved so much that they’re now a part of my regular beauty routine—as well as those of friends and family I’ve recommended them to. Ahead, I’m breaking down the cult beauty products that I’ve tested and love and believe truly deserve all the buzz. Go on to shop the holy-grail beauty products I stand behind, from most expensive to most affordable—including the $12 lip balm that never leaves my bag. I’ve heard a lot of hype about this face cream over the last six months—A LOT—and was eager though somewhat skeptical to try it. But when Fiona Zanetti told me it was “literally a miracle in a bottle,” I knew I had to put it to the test. After months of using it at night, I can attest that it’s truly as transformative as people claim. My skin feels permanently hydrated, with a dewy finish and an even texture. When I moved to NYC a few years ago, my skin immediately started acting up. Desperate to fix it, I booked an appointment with an aesthetician. During the facial, they used Biologique Recherche products, and when I walked out, my skin was glowing. I bought P50 on the spot and have been a devotee ever since. The toner-like formula keeps my skin in balance like nothing else I’ve ever tried. In the cluttered world of skincare products promising to make you look younger overnight, it’s hard to know what you should actually be using, but there’s a reason the C E Ferulic serum from SkinCeuticals has earned cult status. Stocked with vitamin C, it really, truly brightens up the complexion and reverses lines with regular use. When I need a boost of hydration, nothing restores my skin like the facial treatment essence from SK-II. Whenever my skin is feeling dull, I turn to these alpha-beta peels from Dr. Dennis Gross. They make my skin feel refreshed and return its glow. I love these so much I’ve been using them since high school. Celebrity facialist Shani Darden (who sees stars like Rosie Huntington-Whiteley and Laura Harrier) has her own line of products, and they’re seriously epic. I had struggled to find a vitamin A product that worked for me, since most left my skin red or peeling, but that all changed after I tried her Resurface retinol reform. It delivers all of the perks of a retinol without the unpleasant side effects. This candle from Byredo is supposed to mimic the scent of a library filled with old leather-bound books. I know, I know—that sounds kind of bizarre, but it’s truly the most heavenly candle, with a scent that’s warm and velvety. Take a scroll through Instagram and you’re sure to spot these candles. Wait, $70 for a concealer? Yes, it’s pricey. But it’s also the best concealer I’ve ever tried. Celebs swear by this foundation for the red carpet, as do I for an evening out. There’s no question that Dior’s Diorshow mascara has a cult following, and I’m especially obsessed with the blackout formula that’s darker than the regular color. I know, I know, deodorant isn’t the most exciting beauty purchase you can make. But let me tell you, this is one of the best products I’ve ever purchased. Not only do I love the scent, but it’s the best antiperspirant I’ve ever tried. One of the best-selling blushes on the market—and famous for its name. I swear by this perfect pink color. It’s incredible what a difference curled lashes make. They open up the eyes and instantly make me look more awake—and this curler is the very best. For years, I didn’t realize how Beautyblenders were supposed to work. (Pro tip: Dip them in warm water before using.) Since I figured out how to use them the correct way, they’ve become indispensable as a way to diffuse makeup I’m applying. While I’m always experimenting with lipstick shades, MAC’s Ruby Woo remains one of the most iconic colors I constantly return to. The formula is super matte, so the red won’t budge from your lips. I always stock this at home and refuse to travel without it. It’s a micellar water that removes makeup without water, which is why you’ll always find it backstage at fashion shows. Elnett hair spray is something I first discovered in the kits of talented hairstylists I was working with. What I love is that it leaves a flexible hold, meaning it isn’t too stiff, so you can still run your fingers through your hair. With 1540 reviews on Glossier’s website, there’s no doubting the fact that this lip balm is popular. I’ve been using it for years, and it’s something I always carry in my bag. Believe it or not, my dad actually introduced me to this cleanser. 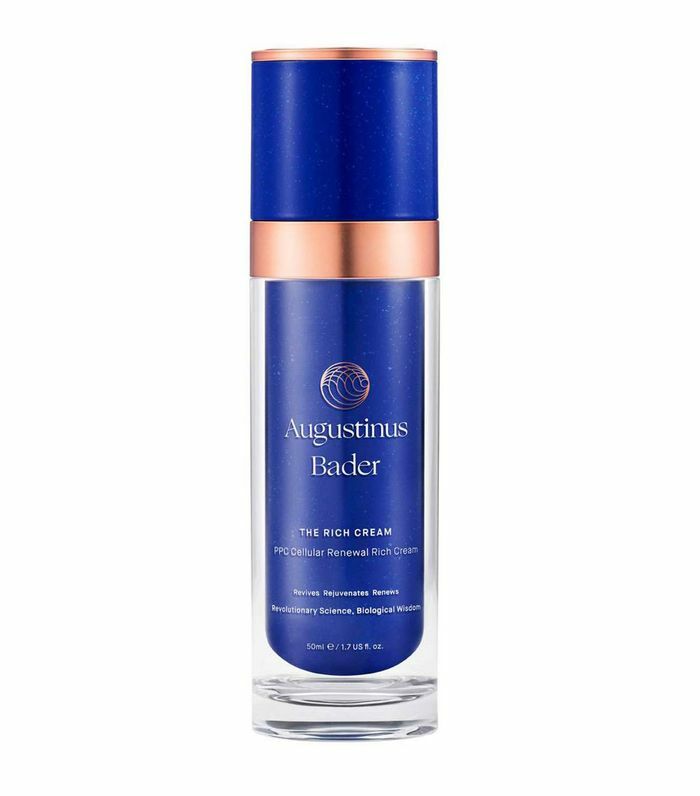 He has sensitive skin like I do, and this is the one of the most gentle formulas around. Next, see the 13 pieces I’m wearing on repeat right now.